"LIEUT. CHARLES EDWARD RADCLYFFE (1ST RO 111p Large format Mint Hardback., being a transcription of the original manuscript of 1818 with historical notes on the author, plus a complete facsimile of the original notebook printed in colour, the whole containing 15 original sketches by the author. 2018. This extremely handsome manuscript cavalry sword exercise is of particular importance because it proves the change in sword tactics at the end of the Peninsular War & Waterloo, from the use of the cavalry sword as a slashing instrument to a stabbing one (hence the evidence of heavy cavalry grinding their swords to a point before battle). 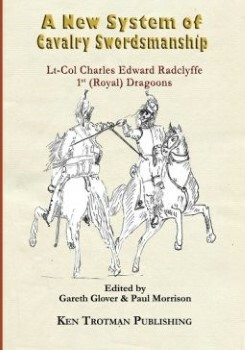 Radclyffe served with the Royal Dragoons in the Peninsula from 1809 to 1814. He also served with distinction during the Waterloo Campaign. During his distinguished service he reported upon necessary changes to sword tactics, resulting in this vitally important study. No printed copies of it have been recorded until now. Because of its importance and charm we have reproduced the original work in straight facsimile but also reset it for easier reading. A biography & letters from the Waterloo campaign are also included."